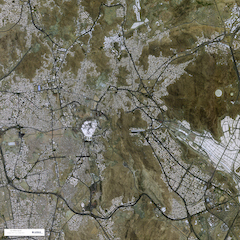 The first images gleaned from the SPOT 7 satellite were published by Airbus Defence and Space. The satellite was launched on June 30th and the images were obtained just three days after launch. Within hours, satellite programming and image acquisition, telemetry reception and processing, were all made operational to deliver these first images. These images depict highly diverse landscapes, revealing SPOT 7 range of ability to capture natural resource and urban zone mapping and agri-environmental monitoring. The entire SPOT 6/7 constellation is now in place and an improvement over the capabilities and performance offered by SPOT 5, the SPOT satellite launched in 2002. Because of the much improved capability of SPOT 6/7, SPOT 5 will be decommissioned from commercial service during the first quarter of 2015. This new constellation offers a higher resolution, greater programming reactivity and a much higher volume of images acquired daily (in monoscopic or stereoscopic mode). Why SPOT 6 and SPOT 7 are so advanced is because they form a constellation of high-resolution Earth observation satellites phased at 180° in the same orbit. According to press materials, this means that each point on the globe can be revisited on a daily basis and wide areas covered in record time, all with an unparalleled level of precision. With both satellites in orbit, acquisition capacity will be boosted to six million square kilometres per day – an area ten times the size of France. With the very-high-resolution twin satellites Pléiades 1A and 1B, SPOT 6 and now SPOT 7, Airbus Defence and Space’s optical satellite constellation will offer the company’s customers a high level of detail across wide areas, a highly reactive image programming service and unique surveillance and monitoring capabilities. This entry was posted on Monday, July 7th, 2014 at 2:00 pm. You can follow any responses to this entry through the RSS 2.0 feed. You can leave a response, or trackback from your own site.